Beyond the old walls of Faro the Ria Formosa lagoon stretched away into the distance, a labyrinth of channels and islands protected from the sea by a line of sandy islets. I’ll confess before coming to Faro I had overlooked this fascinating, nature rich environment (the lagoon stretches along the Algarve coast from Faro some 50km east, past the attractive town of Tavira). Now I was beginning to see the possibilities – a boat ride looked a must; the information board we’d just passed had shown a cycle route skirting the landward edge of the lagoon – could we hire bikes? I got in touch with Bárbara Abelho of Formosamar, a local company, who organise tours on water and land and asked her about the Ria Formosa and the kinds of activities people can enjoy. I think many people will be familiar with the glorious sandy beaches of the Algarve but not know of the Ria Formosa, can you tell us a little about the lagoon and its environments? The Ria Formosa is one of the first views we have when we’re landing in Faro’s airport. Recently elected as one of the 7 Natural Wonders of Portugal, this is one of three protected areas not to be missed during your holidays in the Algarve. This is a unique coastal lagoon which is constantly changing due to the continuous movement of winds, currents and tides. I know that commercial activities like salt panning and shellfish farming have long been important for Faro and other towns and villages bordering the lagoon, I wonder how people use the lagoon today, what their relationship is with it? I imagine recreational use is growing all the time. Commercial activities like salt extraction and shellfish farming are quite important for the local populations. For instance the Ria Formosa is responsible for approximately 60% of the total of shellfish produced in the country. The beaches on the islands are extraordinary places of extensive fine white sand washed by calm warm crystalline waters so they’re a great place to spend the day. The lagoon is an excellent area for those who love water and it can be explore during a boat trip or even on a kayak. The wildlife and the landscape are quite interesting as we explore the enormous biological wealth of the Ria Formosa navigating through secondary channels in the direction of one of the islands of this Natural Park. But the countryside areas of the Ria Formosa are also well worthy of a visit and many spend their weekend cycling, walking and also birdwatching. The Ria Formosa is considered one of the most important wetlands for aquatic birds in Portugal hosting on a regular basis more than 20.000 birds during Winter. This is one of the reasons why it’s considered an IBA (Important Bird Area). For those who like looking at birds, make sure to pack your binoculars. This protected area offers excellent sightings of rare birds like the Purple Swamphen – which is the symbol of this Natural Park, Little Bittern, Azure-winged Magpie, Hoopoe, Avocet, the colourful Greater Flamingo and many more. From a cultural point of view the cities along the limits of the Nature Park of the Ria Formosa are also well worthy of a visit. The Old Town of Faro also known by the locals as Vila Adentro, the busy Market of Olhão and the centre of the lovely town of Tavira are not to be missed. They can easily be reached by train or even cycling along the Ecovia – the coastal cycle path of the Algarve. But you can also just sit, as many of us do, enjoy the warm temperatures and clear skies and relax on the seafront or on a esplanade while enjoying the local beautiful flavours of the Ria Formosa. 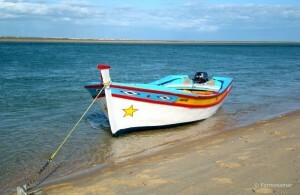 What might you see on a boat trip around the channels of the Ria Formosa? In my opinion it’s one of the most interesting experiences. 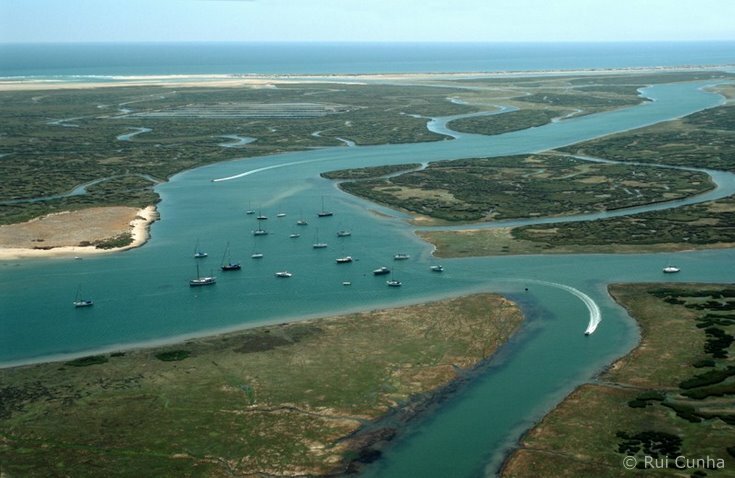 The waterways of Ria Formosa have an enormous abundance of life. Close encounters with birds as we explore the channels and marshes of the lagoon and lovely views of the Old City of Faro. And if we decide to head towards the islands, we can see the local shellfish farmers working hard on the clams farms and the oyster-beds. As we continue to where the lagoon meets the sea we take you to a small paradise of virgin sands and translucent waters. Here we make a short stop so you can enjoy the most from this place where you can take a short walk through the beach, sun bath, take a dip in crystalline waters and marvel with the variety of shells that decorate the dune. It’s truly a lovely and peaceful boat ride out on the lagoon. Can you tell us about the boats you use for your trips? I have to confess here to an interest in traditional boats and being very taken with your colourfully painted, open boats. 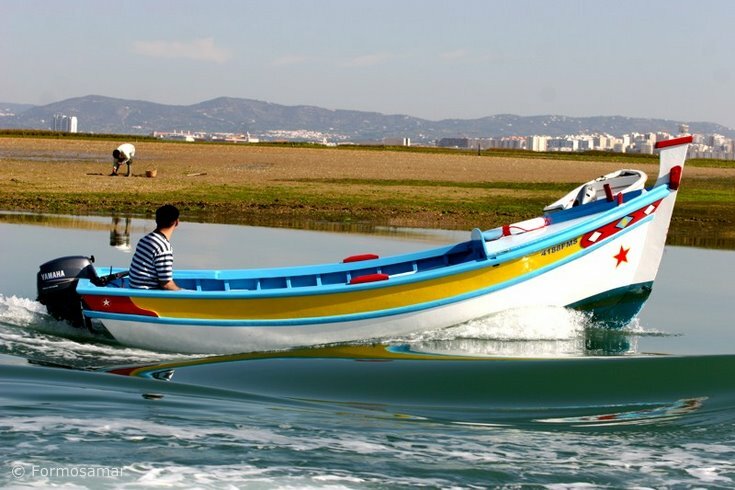 The traditional boats are called “Saveiros” or “Lanchas” and traditionally they are built exclusively of wood and were formerly used for fishing in the Algarve. Some of our boats are almost 60 years old being a part of our local patrimony. Every year they are painted exactly as the fisherman used to paint them even with the eye that adorned its bow, whose origin appears to be attributed to the legendary Ulysses, legendary navigator, symbolizing the divinity of an Egyptian goddess. Lately they have been declining all over the Algarve which is one of the reasons why we recovered the boats – to keep alive our local traditions. Is there a best time of day or state of tide to take a boat trip? In my personal opinion starting the tour when the tide is low, lowering or raising is one of the best to see all the wildlife out on the nature park. But doing a boat trip to see the sunset over the Ria Formosa is something extraordinary. I see you also offer guided tours of the lagoon by kayak which sound a good way of getting close to the wildlife, do you need any previous experience to go on one of these trips? The kayaks are quite stable. They’re sit-on-top, safe, comfortable and easy gliders models. You don’t need to have previous experience to enjoy all the sensations you can live on board a kayak. Taking a kayak to explore the Ria Formosa paddling with your family and friends is a lot of fun for everyone where you’ll find an enormous abundance of wildlife. 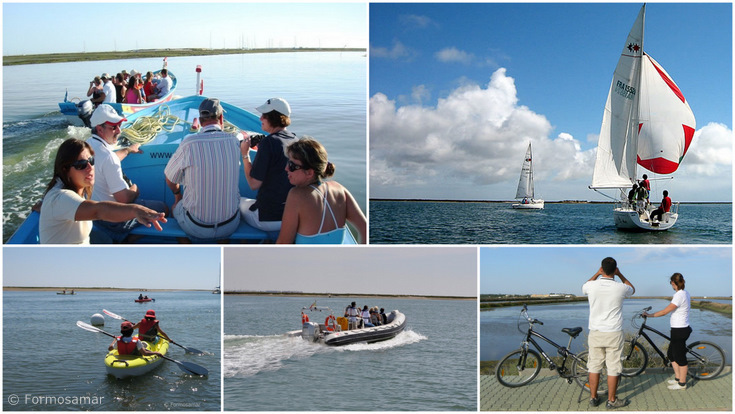 Besides being out on the water what other activities can people enjoy in the Ria Formosa Natural Park ? As you say the Ria Formosa is an important site for waterbirds and birds on migration, what are the best ways to see the birds? The Ria Formosa is considered one of the most important wetlands for aquatic birds in Portugal. From a birding point of view it’s one of the hotspots for birdwatching in the Algarve. Some of best ways to see the birds are on a boat trip when the tide is low or lowering and also on foot for a visit to the saltpans where we have close views of Avocets and Flamingos and to some of the freshwater reservoirs where you might encounter the rare Purple Swamphen. And finally, what’s your favourite meal from the Ria Formosa? That’s a difficult choice because there are so many delicate and appetising flavours here! I would say the clams, fresh fish grilled over a low charcoal fire, octopus salad and the typical “cataplana”. Formosamar's mission is to promote the  Ria Formosa, one of the most important protected areas in Europe.